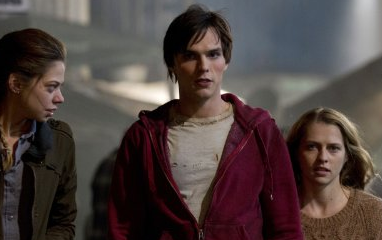 Warm Bodies might just be the best thing to happen to the zombie apocalypse genre in the last couple of years. It takes place at a point in America where the survivors of the great plague have walled themselves into a city with an ever-vigilant military standing guard. Life is harsh. Everyone is restricted. Anyone coming back in from a mission must be optically screened for infection. It’s been years since they started recruiting the youth to be the brave ones to head out beyond the walls in search of food and supplies. That is where we come in when we meet “Julie” (Teresa Palmer). She and her boyfriend “Perry” (Dave Franco) are part of the latest deployment sent outward where the team will meet “R” (Nicholas Hoult), our introspective brain-eating dead guy and narrator who poetically explains for us what it is like to face the daily grind as a zombie. His choice of words alone is worth the price of admission or the DVD rental. After an attack on their group where most are killed or forced to retreat back to base, Julie is captured by R, but food is not on his mind when he does so. Something amazing happens instead. Isolated and scared, Julie witnesses something that no one else has seen—a zombie who knows that vinyl records have better sound quality than digital recordings! Okay, that’s my way of being cheeky while saying this zombie is unlike all others. Spare the need to know the details going in and know that eventually, a romance develops between a walking dead and a beautiful young and living girl. If you are completely unable to wrap your brain around the appeal of such a concept, you need not try any further. If the thought isn’t comical from the outset, then you have missed the main focus. 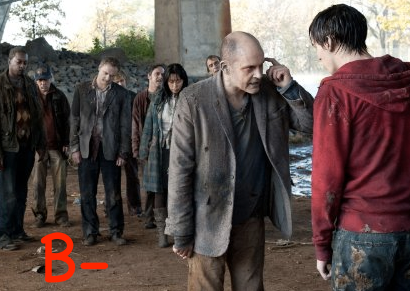 But Warm Bodies does a number of things well when not making us laugh, and sometimes while doing so. Commanding Officer “Grigio,” Julie's father (John Malkovich) is the hardened leader of this segment of the survivors. He assumes his daughter has been consumed. And even when she reappears days later, passes a virus screen, and gives some interesting news, he is not open to anything that might go against the grain of “kill on sight” (anything that didn’t come from behind the walls). Truly unusual circumstances bring us a truly unusual movie. We are caught in the story from the outset before a growing sense of anticipation manages to nearly swallow us whole. Like Zombieland, the film skillfully navigates a script that digs deep to drain the genre dry of the laughable and the bizarre. It appears that this zombie infatuation may still have “life” to give (don’t pardon the pun). Not everything is handled perfectly. 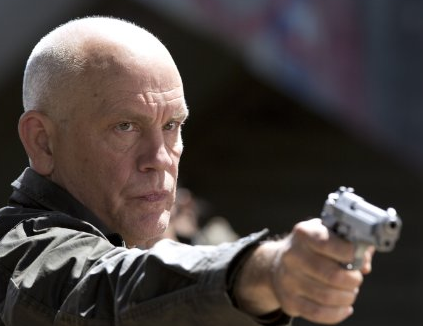 For starters, Malkovich was not a good choice as a military leader. When someone has that disturbed, psychological bend like Malkovich, there just isn’t any shaking it. It is hard to see him in a role that doesn’t involve mastering minute behavioral details. There are also several minor incongruities and a stunt towards the end that would have killed both Julie and R in a fall from hundreds of feet. But we are too absorbed in the fates of Julie and her crush to be all that anxious about any unanswered questions or plot oddities. And there are no really great performances here, but what we get works more often than it fails. There might be truth in saying that the subject matter alone puts this close to being a “must see,” certainly so for zombie movie lovers.